Hello to all. I am still working on Easy Street Mystery being hosted by Bonnie Hunter. I have recently been obsessed with her Quiltcam session, vintage machines and scrappy patterns. I don't know what's happening to me. I am finishing up clue #3, ready to start #4, and #5 will be released tomorrow. Remember, slow and steady wins the race or NOT. Be sure to watch Quiltcam tonight @ 9:00 pm EST. It usually last about 2 hours. If you are like me, it's nice to have someone to sew with, even if it is virtually! It has a quilt retreat feel. is a pic of my progress! I have also put four "pillowcases" in the mail to support the Sandy Hook, CT tragedy. The post I got the information from was Bonnie Hunter's. You can read about it, here's the link: http://quiltville.blogspot.com/2012/12/pillowcase-drive-for-sandy-hook-ct.html Here is a pic of what I sent. An update on Lady G. I am still practicing my ruler work. Right now, I am just using straight edge rulers. I have also done some FMQ on my quilt using a design by Angela Walters. Here's a pic. That's what I am up to! Moving Slow on "Easy Street"
So, I have 80 4patches and an unknown amount of purple geese. I hope to have at least part one complete by Friday. If you want to shop from your stash, join Bonnie and her cast of characters on "Easy Street". I have done a lot, but proud of what I have accomplished. As Bonnie says, "it's not a race". For those of you that have completed parts 1&2, rock on! Just a few more before I went to bed. BTW, if you are up for a treat, join Bonnie on her Quiltcam tomorrow night. Be sure to check her blog for the time! I guess you are wondering what "WIWO" means. Well, it is "what I'm working on" Wednesday's. I'm taking a listeners suggestion of committing to blogging once a week. Thank you Glescagal! It'll be a challenge, but I am up for it. Lady G and the Rail Fence quilt. Custom quilting practice using ruler. I'll add additional pics soon. Easy Street mystery quilt by Bonnie Hunter. I must say, was a little late in hearing about this. I guess I live under a rock. So, after looking at the introduction and clue one I started thinking about participating. Of course there are many enablers and lots of peer pressure they live among my Twitter follower. I have since joined the flicker group. I have made 40 of 194 four patches. Sandy Quilt Block Drive. I pledged to make six block to send off. The pattern is a "Wonkey Log Cabin". My choice was not to use the traditional red for the center. My centers are all different. My logs will range from .75 to 2 inches. The final round will be done in black. I will not be trimming the block as per instruction. * Veterans Day Sew In (VDSI)-Google Hang Out. While I was sewing on the Bernina, the screen kept shutting off. It was sewing fine, when it was on, so I decided to try to finish the chevron blocks. I thought it would be best to complete the top using the same machine. Well, that didn't quite work! I got frustrated having to "reboot" the machine every few minutes. So, I packed her up and off to the hospital for her. She is well overdue for her checkup. continued to work on my "Ups & Down" quilt top. Using the chunking method to complete this little 4" squares-four in each block. I used the MSQ tutorial-swing a 1/4" all around. This is a very quick method for getting 4 hst, but you do have bias edges! I will say, I didn't do quite as much tweeting during the SMSI as I did on during the other sewin. However, I still had fun. The top is remains on the design wall. I am debating to add two borders or just bind it. I haven't decided what color the binding will be. Any suggestions or thoughts on finishing? *Quilt Gallery - Wonky log cabin for "Sandy Quilt Block Drive". I have taken the plunge. I will be making 6 blocks for the cause. I should be able to get those completed and mailed off during my time off. I have chosen black to frame me blocks with. I think the suggested colors were black, dark gray, brown, navy or a dark color that will make your block pop. I have added a link if you are interested. At this time, the block drive is an ongoing effort. You can make blocks, do piecing, or volunteer to quilt a top. A picture of my backing with the diagonal fold. A few shows on my radar coming up soon! It's been over a month since I last podcast, Aug 5th to be exact. I will say I have kept my word, "a minimum" one time per month. Well now I will babble. My Log Cabin block progress is coming along. The blocks have been completed and now they have been cut again to make my wonky pattern. I plan on putting a narrow border, then a larger border and applique a design. I know what I want my finish product to look like, I just have to attempt to put it down on paper, sketch form. That should be very, very interesting. First, how many "Craftsy" classes have you enrolled in? Me, my grand total is 14 and I have my eye on one more. If you like to take online classes that never expire and at your own pace, the I suggest Craftsy. No, they are not paying me to advertise. I just believe in the product. I was interview by Sandy of "Quilting for the Rest of Us" podcast. The interview was to talk about how we tackled our project. We both took the "Stitch and Slash" class. If you didn't know, one of our podcasters has been published in QNL magazine, "Best Xmas Quilts". The podcaster is Tanesha, of Crafty Garden Mom. I plan to make her pattern in her honor. When I do, you know I will be posting a pic right her on this blog. Probably Twitter too. If you like SyFy Series. Give "Haven" a try. But, before you do, I suggest you start with season 1. You can find that on YouTube. My oldest told me about the series, for me she hit the nail on the head. She knew I would like it. My dream come true, I bought a "Gammill" Vision 18-8 with a 12ft table. It will be mid-end October before it comes to live with me. To make room for it, I will be moving out of my MBR into my now existing craft room. Why not, my current BR is just used for sleeping. Now I will have more space and the ability to have all of my craftiness in one room! Here is a stock photo of my purchase. You may ask, what about that grace frame you just bought? Well, I am going to sell it along with the Brother PG1500 for a good price. So I plan to put it on Ebay, in the Savannah classifieds and mention the sale at my local quilt guilds. Just a quick post to remind everyone to remember all those who lost there life on "9/11/01". Take a moment out of your day to pay tribute in whatever way that suites you. I have cut out the 20 wedges for the Dresden blocks. I should finish July's blocks in the month of July. While sitting in my bed watching "Bewitched" on Roku and surfing on my lap top, I realized that I think I may have used the wrong instructor's name in my most recent Podcast. Carol Ann Waugh taught "Stupendous Stitching" and "Stitch and Slash". I may have said "Wendy Butler Burns". Please forgive the oops. That age thing, ya know. In case you didn't know, I am addicted to "Craftsty" an online craft class platform. I am enrolled in several classes! They offer knitting, quilting, paper crafting, sewing, spinning and weaving. What's good about this is that they never go away. If you follow me on "Twitter" or my you have seen a completed project from a Craftsy class. If not, you can find a pic of my completed project as well as the "BOM" that is in progress here: http://iknitnquilt2.blogspot.com/2012/07/happy-4th-of-july.html. This is my foundation for my "Stitch & Slash" block. SwapBot! Do you know it? I am participating in a string block swap this month. The swap is being hosted by Katie, of Katie's Quilting Corner Podcast. We are using Bonnie Hunter's technique for foundation piecing. The foundation we are using is muslin. I love string piecing!! Your 1/4" does not always have to be a 1/4". Great beginner quilter block! FYI, I have completed my 16 blocks. I will be mailing the blocks tomorrow. Each partner will get four blocks. Yay, another completed task for the month of July. Hmmm, maybe I should keep a log of completed crafty projects each month. BTW, sneak peek of the blocks. If you enjoy enhancing your thread stash as much as your fabric/fiber (fSq), check out Connecting Threads website. Essential thread is discounted 30%, $1.74. Can't beat that price and the colors are yummy. I started using this line of thread as a recommendation by one of the Craftsy instructors, Wendy Butler Burns. This is one of her thread choices in her "Stupendous Stitches" class. http://www.littlemissshabby.com/2012/07/fusion-blanket-crochet-along-2/. Here is a pic of my progress. As promised the link for the "Peg Board Thread Holder". A fitting end to this post! Here are my boys!!!!! "Stupendously Artful", a completed Craftsy class. Craftsy free "BOM". I have been playing catch-up with this one. I have completed the first 4 months. Yet another Craftsy class, "Stitch & Slash". I have completed the foundation, it's time to embellish and quilt! What do you think of my color combination of "Citrusy Stitch&Slash"? I am enjoying my time off doing things I enjoy. Enjoy the holiday with friends, family and stay cool. WARNING: Wordy and Picture heavy! What’s been happening with me since I last posted? Well let me tell you, a lot. If you happen to follow me on Twitter, you have already know some of what has happened. Let me begin. I have made the big move! I now live in the peach state! I have been here now for a whopping 3 weeks. My youngest daughter helped me make the drive from VA. She was a big help. The drive took about 9 1/2 hours. Driving with 2 dogs is a new experience for me. Gizmo whined 75% of the drive down. He has been used to sitting and looking out the driver's side window. I know that's not a good thing to do!! So don't judge me. Jodi on the other hand, slept and looked out the back window. Not a peep out of him. For those who may have puppies, I will warn you, don't hold them while you drive. Start them out behind a doggie partition for your vehicle. Life will be a lot easier. Trust me. I spent 4 days sleeping on an air mattress before my furniture arrived. Let me just say, "backache". With the arrival of the furniture, comes boxes! I mean a lot of boxes! I am still going through boxes and probably will be for the next few months. There are a lot of things in this state that I will have to get use to. Like, trash service and dry counties. Since I have been here, my bank account was compromised!!! I felt so violated. Somehow someone got my debit card number and made several purchases for more than $4500! Thanks to my bank, I have had that money placed back in my account. A warning for all who use online banking and make online purchases, check you account daily so you can catch any unauthorized purchases! The new home has given me a new sewing space. Each area of the room is dedicated to a particular function. I now have a cutting/ironing corner, machine quilting corner, sewing/embroidery corner and TV/library corner. Can I just say, I love my new space. In the backgound of my sewing area is the closet. The previous family converted it into an office space. My PC and printer are located there. As you can see, I still have some work to do, I am good with the overall arrangement. My first stash enhancement at my new address! Here is a pic of some hand stitching. I still have some more embellishing to do. I am not sure which I have. Also, I will be a part of the 8" String block swap through Swapbot (http://www.swap-bot.com/). The swap is being hosted by Katie (Quilted Magnolia) of Katie's Quilting Corner. The last day to sign up is June 30th. The blocks have to be mailed by the end of July. I have been doing a little spinning using my "spindle" since I have been here. While the furry babies are running and chasing each other in the backyard, I take the opportunity to spin. They have settled in and thoroughly enjoying their new home. Gizmo is still fluffy and Jodi is now 11 lbs. A Day Late! Week #4 Giveaway. A day late, but not a dollar short! This is the last week of my celebrating with Sandy from "Quilting for the Rest of Us"One lucky winner will win these lovely FQ's. All you have to do is leave me a comment. How easy is that? The drawing will be held on Monday, April 30th. BTW, a new podcast was posted yesterday. Stay tuned, photos to come! It's nice to be back in VA. I have been out of town for the past four days. If you didn't already know, I will be relocating to GA next month. But, that is not why I am posting tonight. Please congratulate "Colleen" for being lucky #3 and the winner of my Week #3 giveaway. Don't forget to check back tomorrow for my last giveaway for the month of April. If you don't know, I am still celebrating Sandy's, Quilting for the Rest of Us, Podcast Birthday. Winner Wk #2 & Week #3 Giveaway! The random number generator picked Sandi as my week 2 winner! She was lucky #5. 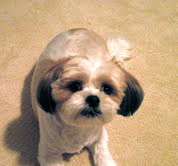 If you see Sandi hanging out on the net, please let her know she won and she has until Friday MN to claim her prize. So if you want to play along, leave me a comment on "how you quilt your quilts". BTW, completed my first New York Beauty block!!! OK, one of four blocks to complete a full circle. Joining Sandy's slow quilt movement! Week #2 in support of Sandy's celebration of 2 yrs podcasting. This week you can win these lovely four FQ's. April. It will be good luck for one lucky winner. While I have your attention, do you follow me on "Twitter"? You should. In the not too distant future, I will be announcing random give away's there. My twitter ID is "KnittyAJ". First I would like to thank all of you who commented. I have read them all and will be talking about "favorite" techniques of my listeners. So, stay tuned for that upcoming podcast. As you recall, I am participating in Sandy of "Quilting For The Rest Of Us" give away for podcast BD celebration. I will be posting another give away tomorrow! THE LUCKY WINNER IS: Gretchen!!! Congratulations. As soon as I get your snail mail addy, I will get your package out to you. Well, it's April 1st and also April Fools Day. This is no joke, I am participating in a month long of weekly give aways. The first item in the block is a charm pack, "Urban Couture" by Moda. Who couldn't use more charm squares? Collect enough and you can make an old fashioned charm quilt. Does anyone make charm quilts anymore? 1. Subscribe to my blog and leave a comment that you have subscribed. 2. Leave a comment about your "favorite" quilting technique. Just a reminder, make sure I can notify you if you are the WINNER! The cut off for entries will be 1100 a.m. on Saturday, 7 April and the winner will be posted at 12 noon. Don't forget to watch for a new post on Sunday for another give away! Join Me In A BD Celebration !!!!! I am joining the party to celebrate Sandy's podcast birthday!!! I know all of you know who she is. Just in case you don't know her podcast is "Quilting For The Rest Of Us" and it has been 2 years. So, I will be having a give away each week for the month of "April" to help her celebrate! I will be posting a pic and how to enter the give away each Sunday beginning tomorrow, 1 April. The last give away post will be 22 April. So be sure to check out my blog each week for new posts. PS Sandy, Hope you don't mind that I borrowed your BD image! Do You Watch Online Quilt Shows?? Do you watch online quilt shows? If so, which ones and are they helpful? The reason I asked is that during "National Quilt Day" weekend, the Quilt Show was free the entire weekend! I took full advantage of the shows. At one point in my life I did subscribe to QNN, however I've found that I like the Quilt Show a little better. I am a subscriber of "Craftsy". I like the fact that once you sign up/subscribe, you can watch the show as many times as you like. I also like the fact that it never expires. So, that my questions to you. Share your feed back with me. 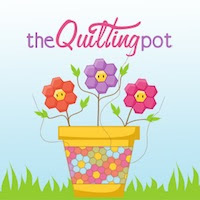 For those who listen to my podcast, the show notes for episode #17 can be found at http://thequiltingpot.podbean.com, you can listen there as well. I will be posting some pics of the things I talk about here. Here's my complete table runner top! I used Deb Tucker's Rapid fire ruler for this. If you recall this was the "emergency" that caused me to break my fabric diet. Speaking of fabric diet, it has been 29 days. If you follow me on Twitter, you may have seen this completed top. It's the "Pocket Full Of Pinwheel" quilt top by Riley Blake, Freckle Whimsy. If you would like to see the tutorial, here's the link: http://www.rileyblakedesigns.com/cutting-corners/2010/11/10/pocket-full-pinwheels/. Command Strips! The best invention when you don't want to put holes in your walls. Perfect for renters. Well, this is what I am now using to hand some of my quilting tools. Last but not least. I am planning yet another project. I have a "New York Beauty" quilt/wall hanging on my mind! Of course it will be a paper piece project. You almost have to with those pointy point. It's a known fact that I still struggle with precision when piecing. I have the add a quarter ruler, foundation paper piecing paper by Carol Doak and I am ready to give it a whirl. Well, I think this will be it. I had more to say than I thought!!! So, stay tuned to see what's next.